I wish a very HAPPY & COLORFUL DIWALI to all my readers,friends and family!! I hope everyone is busy with the Diwali Celebrations and so am I.I hope you all liked my Diwali sweets and snacks posts which I did for the last couple of weeks and to end the Diwali celebrations in my blog I have chosen a finale dessert 'Shahi Tukda' and I hope you like it.This dessert is even apt for your Diwali Dinner party,so make this dessert for your Diwali party and be ready to receive various complements from your guests. Few recipes fit for the Kings and this recipe is one among them which belongs to Nawabi Cooking Category. 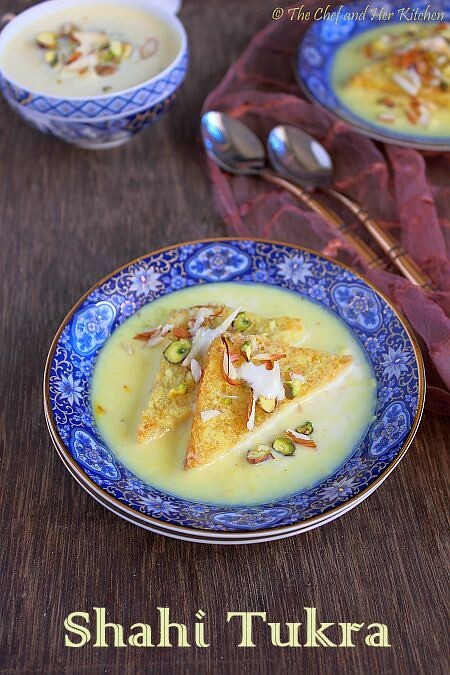 Shahi Tukda is one of the rich desserts which is famous in North India and is a closer cousin to the famous 'Double ka Meetha' of Hyderabad.Many get confused that 'Shahi Tukda' and 'Double ka Meetha' are same,I would say that they are similar as the ingredients that go in both the recipes are almost same but the way they are prepared and served is bit different.I will post my recipe for Double ka Meetha sometime later. 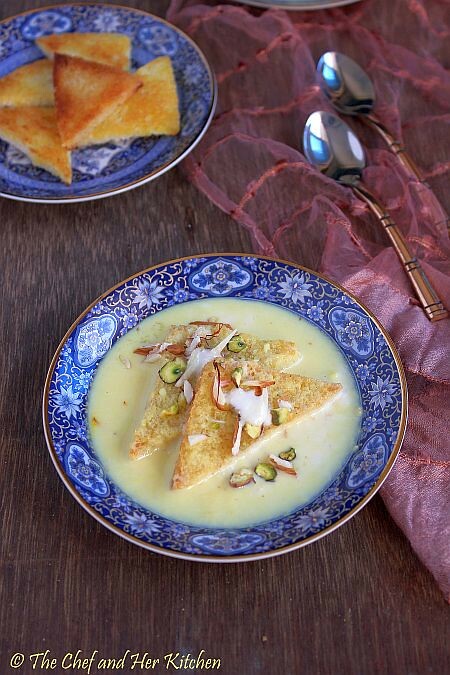 Here are the few differences between both the desserts.The deep fried bread slices are served with rabdi in Shahi Tukra where as in Double ka Meetha the deep fried bread sliced are cooked in the sugar syrup and mawa(or thickened milk) and is turned to a slightly chunky halwa consistency.Hence the texture and taste of both the sweets definitely vary.How ever this is my perception and understanding of these desserts,if you know more about them I am all ears to hear your thoughts about this. I usually do not opt for rich desserts as we both do not prefer much of fatty foods on regular basis.These kind of desserts are usually prepared on some special occasions or for parties.It is not only a calorie loaded dessert,it is bit time consuming with the preparation of rabdi.However I have given few easy options and also low fat alternatives in my notes.It is left to your choice,you can opt the low fat version or the traditional rich and sinful version. Boil full fat milk over low flame stirring occasionally to remove the cream layer formed on top and sides and mix in the milk and boil until it reaches 1/3rd of the consistency.This would become thick like rabdi.You can use non-stick or regular kadai for this process. Meanwhile soak few saffron strands in a tbsp of hot milk.Rub the saffron strand in between your fingers before adding to the milk. Add sugar,saffron infused milk and boil until the sugar melts.Check the sweetness and if you feel it is less you can add a couple of tea spoons of sugar at this stage. Heat sugar and water together in a vessel and heat until it comes to syrupy consistency.Keep it ready.While few recipes call for the sugar syrup to dip the bread slices,I will say it is optional.You can dip the fried bread slices in sugar syrup or/and you can serve them with rabdi. Cut the edges of bread and cut each bread into four triangles.Keep all the bread slices ready. option-1 : Heat ghee in a kadai and once it is hot deep fry the bread slices until they turn light golden in color.Add bread only when the melted ghee is hot,otherwise it will soak up lots of ghee. option-2 : Heat a wide pan add 1-2 tbsp of ghee and place the cut bread slices and roast until brown on one side and add few more tbsp of ghee and roast on the other side until golden in color. Remove the roasted bread slices and drop them in sugar syrup for few seconds and let the syrup coats on both sides of the bread slices and keep them aside.Do not dip for long time. Pour some rabdi in the bottom of the serving plate. 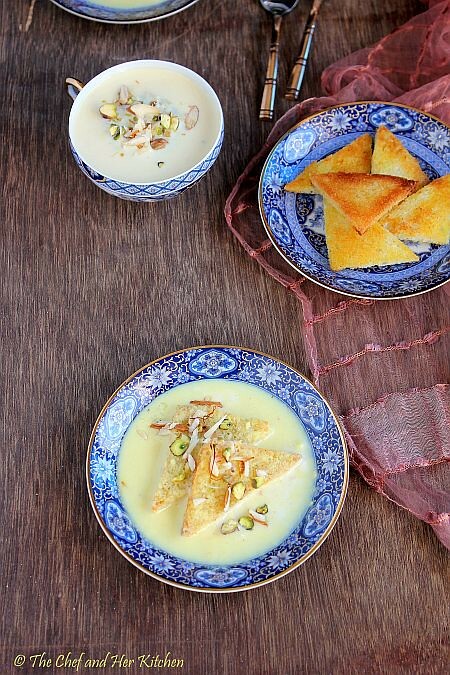 Dip the sugar syrup dunked bread slices in the rabdi and place them in a serving plate. Pour some rabdi on top of the slices. 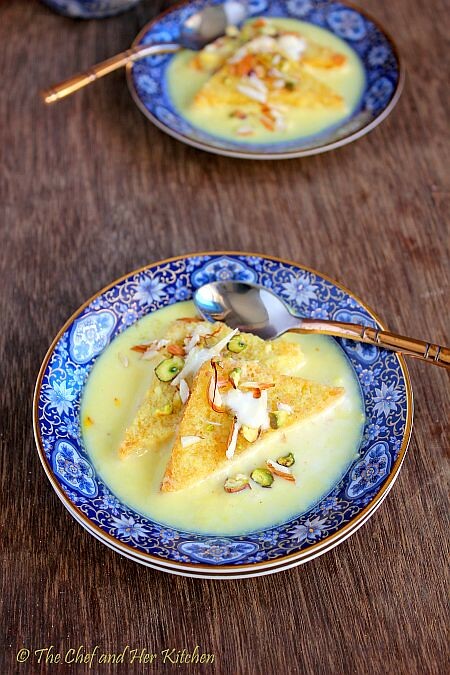 Dot it with some malai on top. 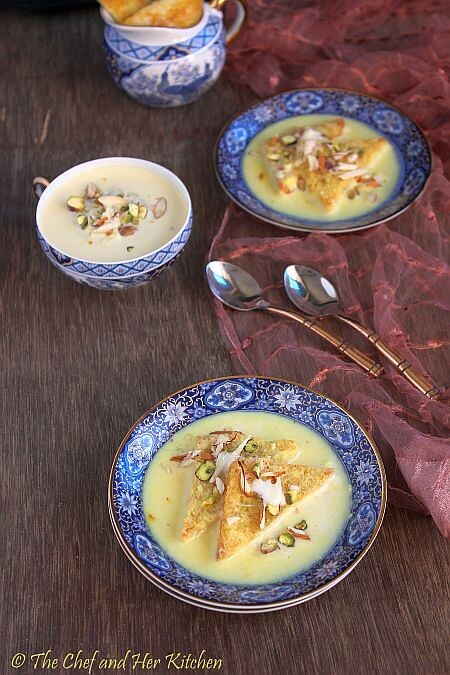 Garnish with sliced pistachios,almonds and saffron strands. 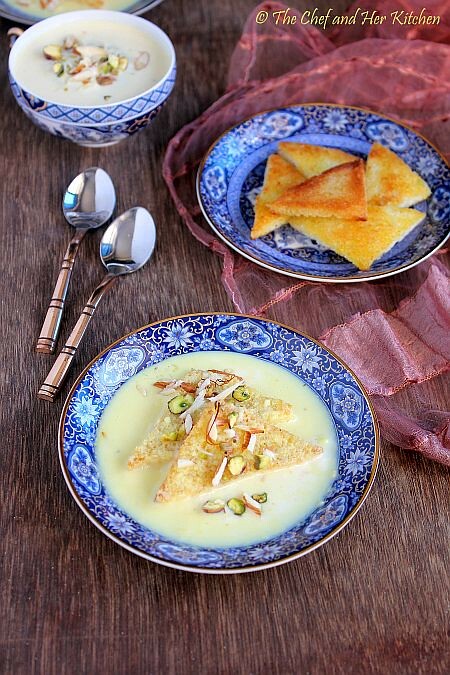 Serve it warm or at room temperature.You can even serve warm bread slices with cold rabdi.It is according to your wish. 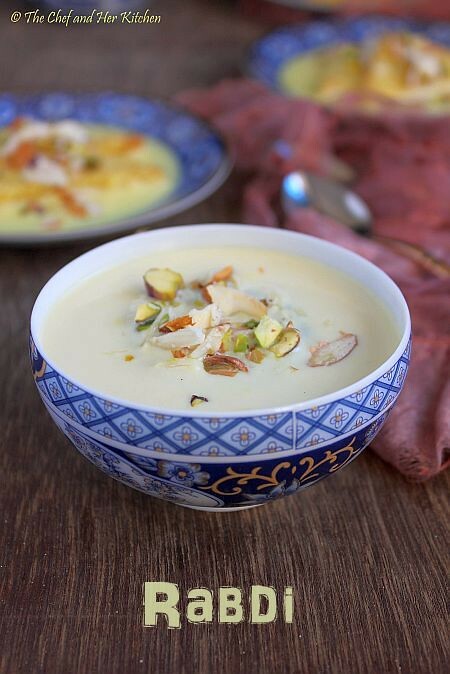 You can add 2-3 tbsp of mawa/khoya or condensed milk to the boiling rabdi to make it rich.It is optional though and also adjust the sugar quantity accordingly if you are adding condensed milk. While few recipes call for the sugar syrup to dip the bread slices,I will say it is optional.You can dip the fried bread slices in sugar syrup or/and you can serve them with rabdi. I always prefer ghee to fry the bread slices-you can either deep fry or shallow fry according to your wish.I do not suggest to fry bread slices in oil as it spoils the taste of the dessert.If you are calorie conscious you can roast the bread slices on tawa using ghee to roast them until golden brown. Always use a day old bread for the recipe,if we use fresh bread it soaks up lot of fat. You can use white bread or brown bread in the recipe. Always cut the edges and you can use any fancy shaped cookie cutter and can cut the bread into various shapes according to your choice. You can keep the deep fried bread slices in a dry storage container for up to half a day.They stay crisp. Rabdi can be prepared a day ahead and can be refrigerated for 2 days. You can even garnish with silver leaf(edible silver foil) on top before serving. Use low fat milk instead of full cream milk in the recipe. I usually thicken the milk by stirring it continuously and is the most traditional method.If you are pressed for time you can add 1/4 cup of fresh bread crumbs to the milk to make quick rabdi following the same process.Adjust sugar accordingly. You can roast the bread slices on tawa using ghee to roast them until golden brown instead of deep frying them. If you have not decided what to make for Diwali,check out my list of DIWALI SWEETS RECIPES and DIWALI SNACKS RECIPES for some easy and quick options. Have a Happy and Safe Diwali.Would catch you all soon with yummy recipes. 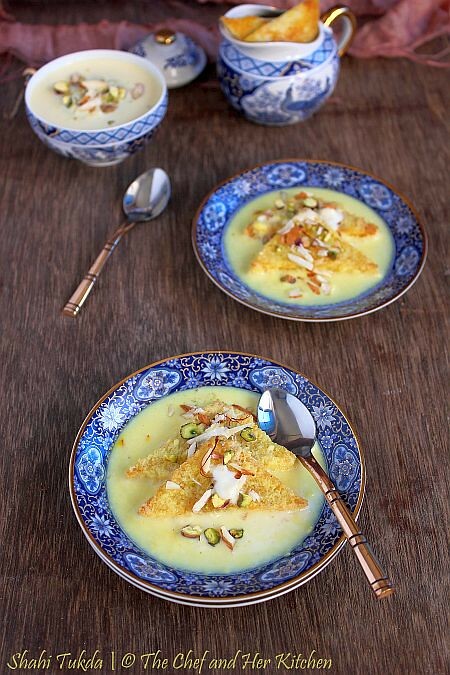 Wat a delightful rich looking shahi tukda, super tempting. thats a divine dessert which I can have anytime. gorgeous presentation. hello Prathiba I am a huge fan of yours. But I just came with a doubt just as you mentioned in about me that if anyone does any recipe seeing your blog you would appreciate if they mention your name. But the same thing implies to you too. I saw this recipe in sailusfood but you never mentioned her name. Hi Anonymous, Glad to know that you like my blog. 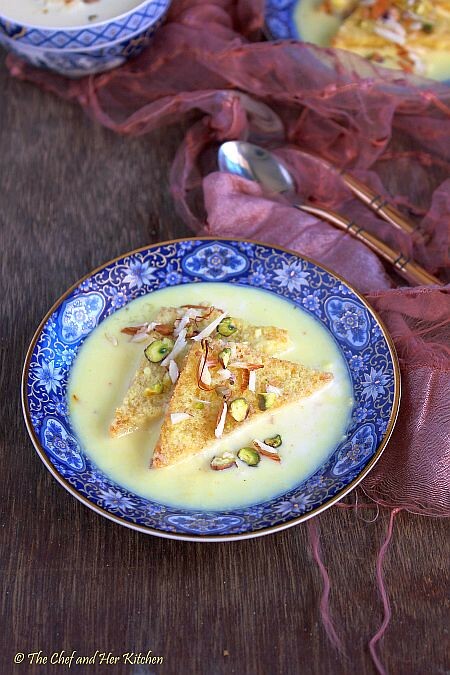 This is a very common dessert recipe and all the recipes would sound similar because of the same preparation process.I am not sure whether you see other blogs or not apart from Sailus food.If I had followed her recipe I would have definitely mentioned the credit but I didnot. (You can see lot of other posts where I had given credit if I had followed their recipe).Hope this explains!! This is my all time fav dessert and way too tempting. Nice pictures Prathy !!!! Wish you and your Family Happy and prosperous Diwali !!! All your postings are too good. Loved your photos. Very beautiful. If you have a time, please visit my blog "Madappalli"
Mmmmm... This reminds me of home. 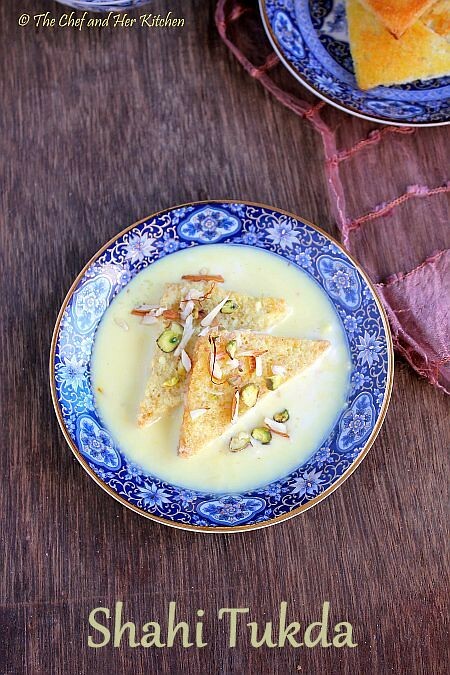 We used to have Shahi Tukda( we call them Meetha Tukda as well) during Ramadan and the dish was my absolute favourite. Its been years since I last had it. Now I can try this myself . Thank You!